On PoolTables.ca you will find classic and modern billiard design show-pieces, constructed of solid North American and European natural woods such as Beech, Poplar and Ash (for the exception of the Frontenac model, which uses MDF with natural wood veneer for the legs). ► Click here to see wood finishes. We use natural wood for the exceptional durability and stability it provides. Many competitor's pool table models use low quality wood products, even for their top and side rails. All of our pool table's top rails, side rails and the greater majority of our frames are made of solid hard wood. In addition, all of our models have their own style and characteristics to blend with any type of decor, furnishings and architecture. It is important to note that the leather tooling and other decorative finishes on our tables have been carved by hand by artisans known for the quality of their work. With our impressive selection, whatever your lifestyle, PoolTables.ca has a model for you! Slate is a metamorphic rock of sedimentary origin, containing many minerals such as quartz, feldspar and mica. With a low rate of mildew absorption and its great stability, slate is ideal for the manufacturing of billiard tables. PoolTables.ca uses premium slate that is 1 inch thick, in 3 pieces, and polished to 10/1000 inch. Extracted from opencast mines, this slate is more robust than the slate of other countries often extracted from underground mines. Extraction through open-air mining (in mountainous regions where tectonic movements are infrequent) allows for us to achieve a slate of great stability that is perfect for the level, precision and durability required for the game of billiards. It is important to note that our slate is diamond honed, while some imported slates are polished with a hand saw; thus reducing the level and accuracy of play. Most importantly, the premium quality slate used for our pool tables has a very low humidity absorption characteristic, rated at 0.18% (ASTM C121), which means that this raw material has virtually no propensity to absorb water once it has been processed, thus making it immune to any warping which can occur with slates which have a higher moisture absorption rate. The construction accuracy and the material integrity of our slate will provide you with the straightest and most consistent playing surface for many decades of billiard enjoyment. To ensure quality and accuracy of your game for years to come, Majestic Billiard provided the frame of our tables with two central beams in solid 1 ½ inch x 6 inch wood to extend the entire length of the table; supported by two cross beams for maximum stability. In addition, all tables on PoolTables.ca are assembled with moulded metal brackets into the wooden panels. Each screw used is screwed into its corresponding piece of metal brackets. This mechanism allows you to assemble and disassemble our billiard tables several times without damaging components or the structure. The advantage of not using pressed wood or melamine adds an element of stability to our tables during travel or transport. Like all other components of our tables, Majestic Billiard uses rubber cushions of the highest quality. Our cushions are composed of a high-performance rubber that provides high accuracy rebound. All tables are equipped with K-66 profile cushions. This gives you an exceptional reference, speed and accuracy for optimal moves. All our rails are manufactured from North American and European natural solid woods. They are securely fastened to the frame to transmit without loss or distortion, the exact ball bounce for perfect accuracy. This provides a game quality worthy of tournaments and BCA (Billiard Congress of America) standards. The aiming sights that you find on all Majestic Billiard pool tables are encrusted with precision and serve both as a point of reference as well as a decorative trim. They are made with various materials like mother of pearl, abalone or composites and available in various shapes, they give your pool table a beautiful aesthetic finish and shot accuracy. Majestic Billiard’s table legs offer high quality both in the construction and the finishes. Since the greater majority of our pool table's legs are made of solid North American and European natural woods such as Beech, Poplar and Ash, the legs will provide better stability and support, as well as decorative beauty. The wide variety of styles and patterns are available to help you find the table that will fit in perfectly with your interior space. *The square leg of the Frontenac pool table is made of MDF (Medium Density Fiberboard) laminate with a real hard wood veneer. The legs of the Majestic Royal are made with a combination of solid wood for the main leg vertical support and a laminate on the outer side faces. That way, you don’t have to worry about its durability! Why compromise on the playing surface, when the rest of the table is built with premium quality components. PoolTables.Ca as a standard, uses Championship brand billiard table cloth, which is Teflon© treated to minimize stains and reduces the chances of water rings if you accidentally get your cloth wet. 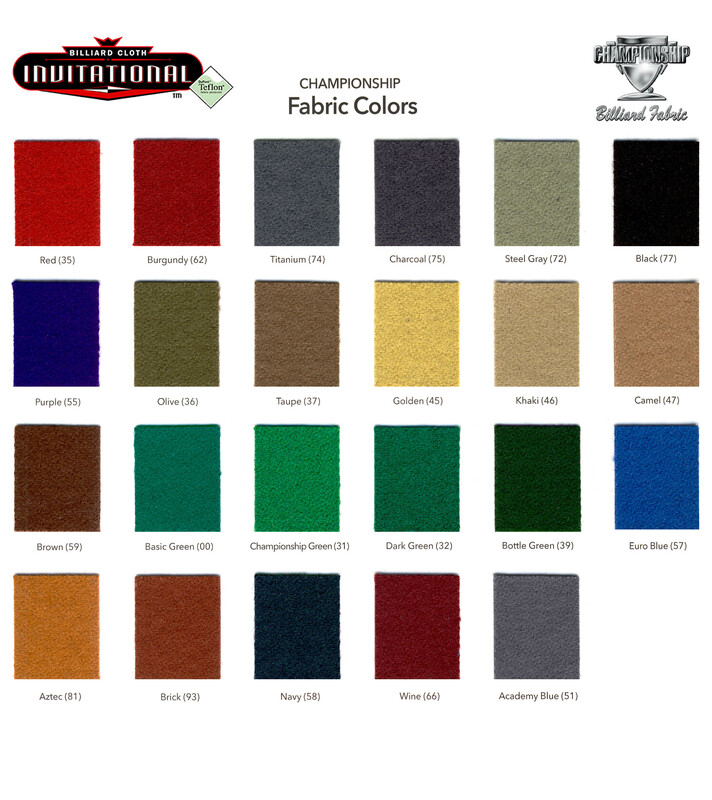 Championship has been making quality cloth since 1965, with perfect blends of materials for longevity, resilience, consistency and shot accuracy.